The rope bed reigned in bedrooms from the 16th century until the late 1800s when the first coil spring mattress was constructed. The history of the rope bed is tightly woven with the history of the mattress and the four-poster bed. Modern beds have their roots in the rope bed. Early mattresses were made by laying piles of leaves on the bed (whether that was on the floor or on a platform), but as early as in Roman Times, more luxurious bedding was in use. The ancient Romans stuffed their mattresses with materials such as feathers or reeds. People in the Renaissance period stuffed their coarse ticking mattresses with straw or pea shucks, and then covered them with velvet or brocade. Early beds were constructed with warmth in mind. They were generally built alongside a wall, with a tester, or roof, suspended by rope from the ceiling or wall. The bed was usually fully enclosed with either heavy drapes or doors. The door-enclosed beds are known as Dutch box beds. Four-poster beds were originally built alongside a wall as well, but were later built as freestanding units. The four tall posts held up the tester, made of wood or fabric, as well as heavy hanging curtains, so that sleepers were fully enclosed. Early beds were enormous—large enough to sleep several people. Probably the most famous of these is the Great Bed of Ware, which is on display at the Victoria and Albert Museum in the United Kingdom. Both William Shakespeare and Ben Jonson referred to it in one of their plays. By the mid 1800s, fabrics such as cotton and linen replaced the rough ticking of earlier mattresses, and in 1865, the first coil mattress was patented. Eventually, rope beds fell out of favor. Kate Hillsing has been a freelance writer and editor since 2005. Prior to that, she put her diploma in business administration to work in executive search and outplacement firms. She writes parenting articles for various print publications. 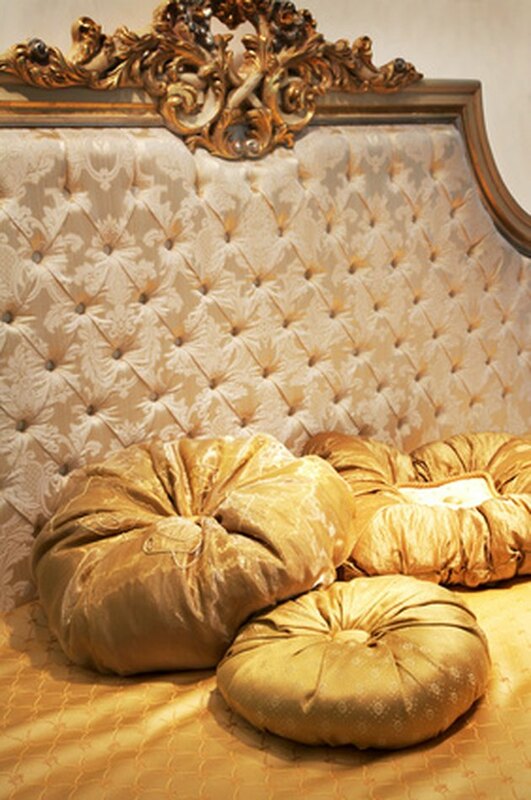 What Does Tufting Fabric Mean?